The recipe is one of many I saved 'online' for quick reference. 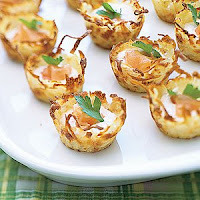 Potato Appetizers with Smoked Salmon. I think these would be absolutely perfect for an Easter gathering! Pulse the smoked salmon and lemon peel in a food processor, scraping down bowl. Add sour cream and process until combined. Refrigerate, covered, until ready to serve. Bake potato bowls until edges are dark golden, about 25 minutes. Cool in pans for 10 minutes. Carefully remove the bite sized potato bowls from pans and place on a baking sheet lined with paper towels to set for up to 4 hours at room temperature. Preheat oven to 375°F. Place potato nests on a clean, large baking sheet and bake until heated through and crisp, 6 to 8 minutes. Transfer potato nests to a platter. Using a small spoon, dollop about 1 tsp. sour cream mixture into each potato nest and top each with a tiny strip of smoked salmon and, if desired, a parsley leaf. Serve immediately.